A police investigation has been launched after a raider unbolted stable doors and farm gates to let horses and over 120 buffalo loose onto icy main roads. The incident happened at around 4am on Sunday morning (March 4) at Shawsmill Stables and a nearby buffalo farm in Shawsmill, Scotland. CCTV footage appears to show a male of slim build, approx 5’ 7 tall, wearing slim fit/skinny jeans and a light-coloured long sleeved top entering private property and unbolting several stable doors in three different stable blocks - letting a number of horses loose. The raider then proceeds to kick the horses upon letting them loose. Several horses were able to wander onto dangerous, icy main roads. 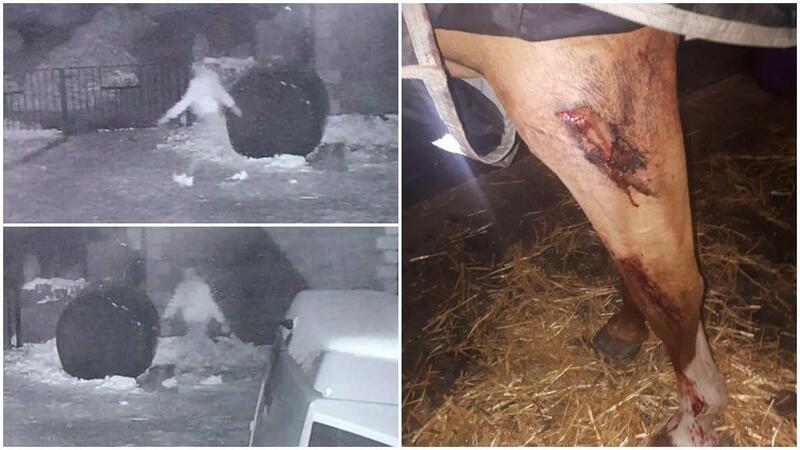 One horse has serious injuries from falling on the icy road. In addition to this, neighbours at a buffalo farm nearby suffered a similar incident with 18 heavy steel gates being opened - letting over 120 buffalo loose into the snow and ice. The stress caused one buffalo to give birth to her calf early and it is unknown if it will survive. The property is also covered in blood from several injured buffalo. A social media post from Shawsmill Stables read: "It’s appalling to think of the terror that these poor horses and buffalo have been subjected to in the early hours, being made worse by the terrible weather conditions. 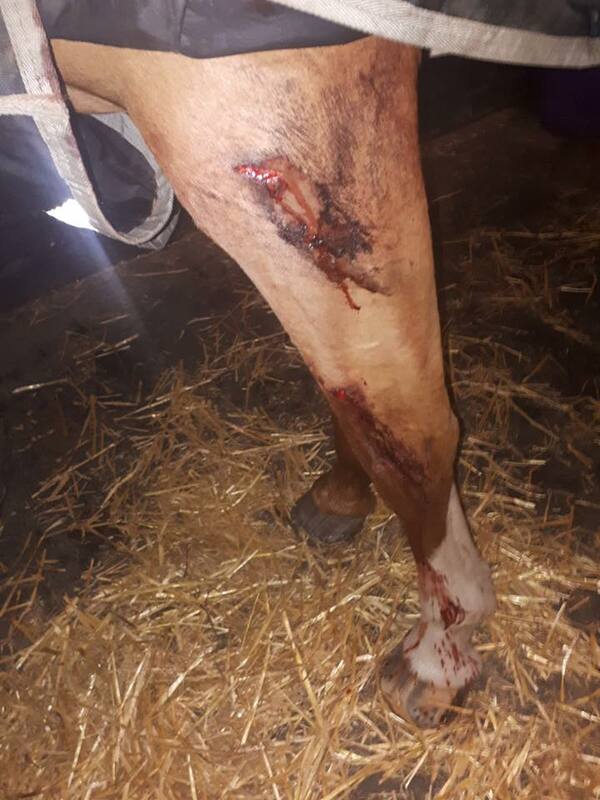 Ashley Stewart from Shawsmill Stables told Farmers Guardian: "The incident caused me a lot of shock and worry - both initially when I was attending the scene in the early hours of the morning - trying to get the animals to safety - and then later when I have been dealing with my horse’s injury. "It saddens me that I take every precaution to keep my animals so safe, pampered and happy but one man can climb over a fence onto private property and ruin that safe, happy place I have created for them. "It’s like someone breaking into your house and hurting your pet dog. You can see in the CCTV that he actually kicks and shoves my horse. If you put yourself in my shoes and think if someone on the street came up and kicked your dog and then set it out on a 60mph road - how would you feel? "I’m absolutely heart broken that my horse is currently stood in her stable in pain, unable to move freely and obviously very anxious herself due to the events." "My message to the person who has done this would be - please do the right thing and turn yourself in. "Myself and my animals will all rest easier knowing that this person will never do something like this again. 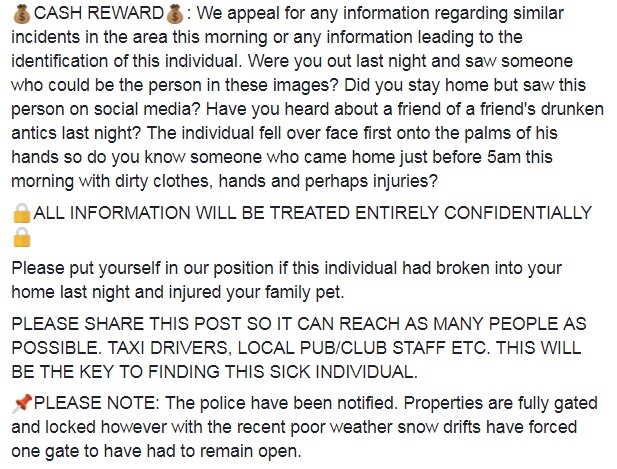 "I feel like this person must feel bad for what they have done so I beg them to come forward so we can all move on with our lives safe in the knowledge that this was one stupid act that will never be committed again."